You may have noticed it’s been a few months since my last post. Likely you didn’t, but I still feel I owe you an explanation. What follows are not excuses, merely facts. I never promised to post often, my only commitment is to making what I do share original and worth reading. But in case you are curious, here’s what’s been going on. Only one post on the blog, but I did create a huge album and playlist as a gift to my burner friends. If you look closely, the link to it is hidden on this site. So I was writing a ton, but not so much blogging. It’s cliche to say so, but Burning Man was nothing short of awesome—in the traditional sense of the word: fearsome and awe-inspiring. Here’s a few photos from my trip. 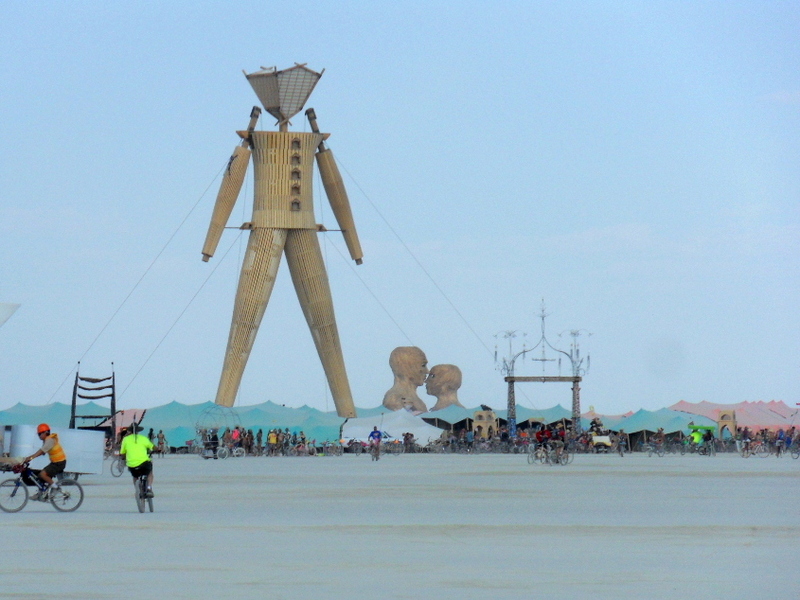 I have three locations on my bucket list: India, Burning Man, and Barcelona. In 2014 I ticked two of these off the list and this summer I go to Spain. Don’t worry, this isn’t a made-for-TV-movie about a terminal patient looking to seize the day. The opportunities just presented themselves all at the same time, and I was in the lucky position in life to take them. Still, I know with this kind of luck I have to be on the lookout for falling anvils and black cats. I did actually write a long post about India, but I’m still sitting on it. It’s controversial and I want to be sure I have my thoughts in order. Here’s a tiny selection of the photos I took in India (really tiny, all of these are just from one day). If a web log is a journal, I know I should have written a post for each day of my journey. But I already put a lot of time into sharing all those photos with my Facebook friends, and really, do strangers on the Internet want to see my photos of India? I’m not sure if you do. Here’s that sample anyway. After going home to visit my family (and surviving with zero drama! Amazeballs!) I was offered a writing gig for a kickass site. I’ve been doing copywriting for years here and there, but this was the first time I needed to write several posts a week. And I’m not just writing about lame stuff, but my favorite things ever: books and music. At the end of the day, I often feel my writing urge satiated by my nifty job. Not only do I enjoy the content, I’m proud of my work there. To get a taste of what I’ve been up to writing for my new client, here’s a recent interview I did for the site with PEN/Faulkner award-winner TC Boyle. As you can see, everything is just grand over here. No complaints and no apologies. But there are some other issues that have made me hesitate to type at’cha. I put a lot of work into setting up separate Tumblr blogs based on the themes I write about, but my love affair with Tumblr has gone sour. The culture of the site has become, at its worst, vindictive and mean. At its best, it is often shallow. But the real gripe I have with Tumblr is that when I share photos with my tablet or phone, they always come out pixelated, and my emails to support on this issue have never received replies. Meanwhile, the music site I adore, wherein I have more than 42,000 followers, also stopped offering support. Most likely because of conflict with the recording industry, they killed all their uploads and now they only play YouTube videos. It’s not what it once was, and I’ve yet to find a suitable replacement. You may think, what does Tumblr and some music site have to do with this non-Tumblr, non Blip.fm blog? Well Tumblr was motivating me to share my adventures in San Francisco. Blip.fm was motivating me to share great music. Both of these things would froth over the short form and, to continue the metaphor into cliche, the cream would rise to the top as blog posts. Now I’m not sure how to proceed. Should I give up my Tumblr blogs, and just post everything here? If I do, there will be a lot more short content, like single songs and videos without so much explanation. But I’m not sure if I want that. I like that any post you click on here will have plenty of original content, and hopefully some new ideas too. I’m still pondering these ideas. Maybe I need a rebranding. Maybe I just need a little encouragement. Maybe I will post here less often as people are kind enough to pay me to post elsewhere. But like I said, no apologies. This blog may be sparse lately, but not my life. My life is amazing. 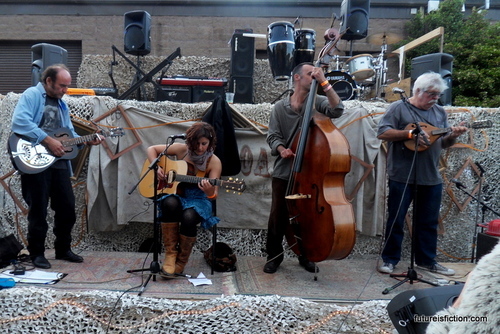 Decompression is a street festival celebrating the return of Burning Man participants. It’s a way for those who’ve returned from the Playa to get one last whiff of that Burning Man magic while giving tourists a chance to see some of the art, mutant vehicles and outfits still freshly covered in dust. I’ve attended Decompression for years now, but it was my first time going after my freshman year as a burner. I found myself seeking people who’ve been there, not because I wanted to be exclusionary. I’d arrived several hours before my friends, which meant approaching strangers. It was easier to approach burners because I knew they would be likely to practice the principle of radical inclusion. I met some beautiful people in any case. Below are some of my favorites moments. I’ve seen these guys around San Francisco and they always get people dancing. When they began playing in the park, I followed them. 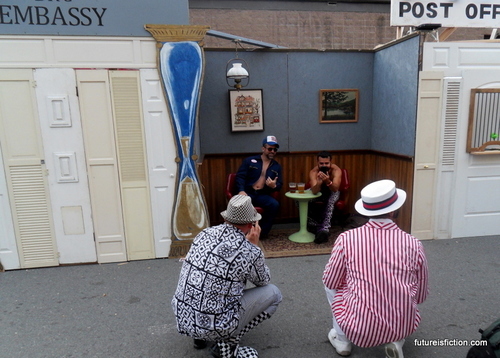 It reminded me of a miniature version of the way burners will follow the best DJed art cars around the playa, circling them and creating an impromptu dancefloor. 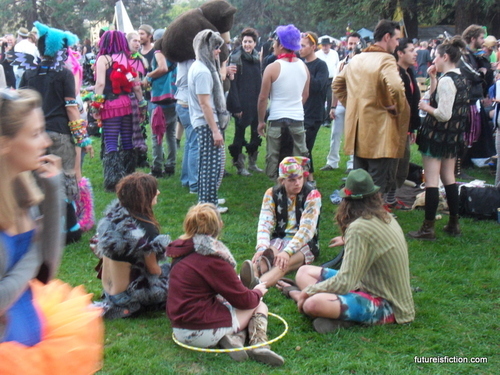 Some of the many beautiful people showing off their radical self-expression at Decompression. You may think of these as costumes, but I prefer to think of them as outfits. One of the principles is radical self-expression, so we are encouraged to wear clothes that stand out, rather than fit in. They only way to truly fit in at a burner event is to dress in a way that’s not quite like anyone else. One of many things I wanted to try out at Burning Man (but didn’t find the time) is the Black Rock Roller Disco. I was so happy they were at Decompression. There were some amazing skaters there, doing coordinated dances. After I got on the skates myself and realized how uneven the asphalt is, I was doubly impressed. I saw these dancers and they were so good that watching them made me want to dance too. So I told them and they welcomed me into their circle until my camp arrived. They were the members of Future Best Friends Camp. They gave me a necklace and made me promise to give it to my BFF. It was nice to see a camp still giving playa gifts (I brought fingerlights to give away). When I make it back to the playa, I will be sure to visit their camp. Who knows? Maybe a future best friend is there. At every Burning Man event, there will be art that lights up and museum-worthy mutant vehicles playing music. 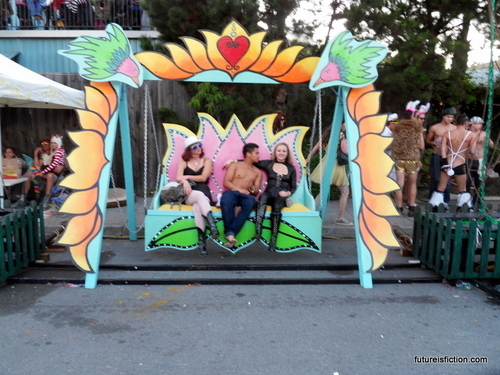 At Decompression you’ll find amazing costumes, interactive art, and beautiful people. I posted more Decompression pictures on the tumblog bayisbetter.tumblr.com.